New tickets report as well as the ticket sources report will let you know how many ticket cases are you getting and where to those tickets come from. They are a good source of information about the number of cases that can’t be resolved within one touch and have to be escalated. This report provides the total number of new tickets for a given time period. 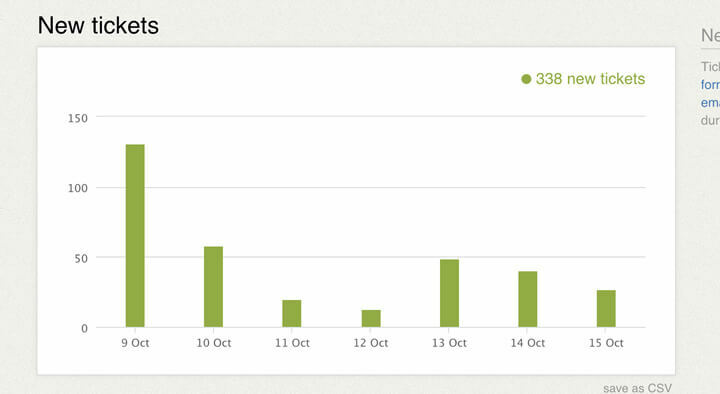 You can see how many tickets you got daily or how many tickets are created for a given part of the day (with the 24-hour distribution enabled). You can also check how many tickets were created for a particular group. This can be useful when you are running live chat on several sites and you use different groups for each of them. Alternatively, you can check how many tickets your departments get. There are several sources from which you can get your tickets. 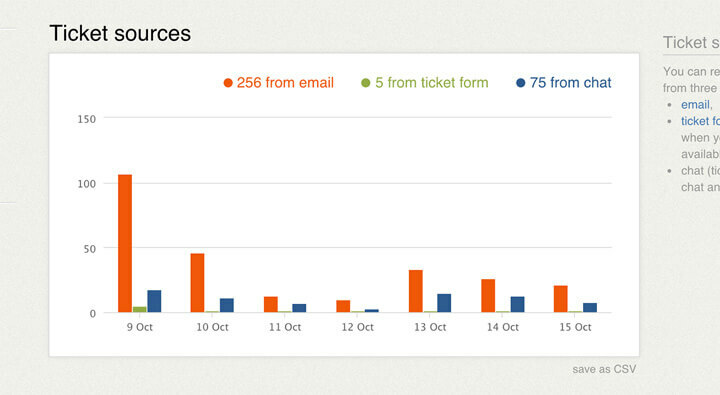 The ticket sources report will tell you how many of your tickets come from email, chat or the ticket form. The three ticket sources are represented by three different bars, one for each ticket source. You can click on each of the bars to check the tickets from that particular group. Manually created tickets – you or your agents can create tickets manually from in the ticket section. These tickets are not represented in the ticket sources report. However, you can still find them easily in the archives as each manually created ticket starts with an agent message.